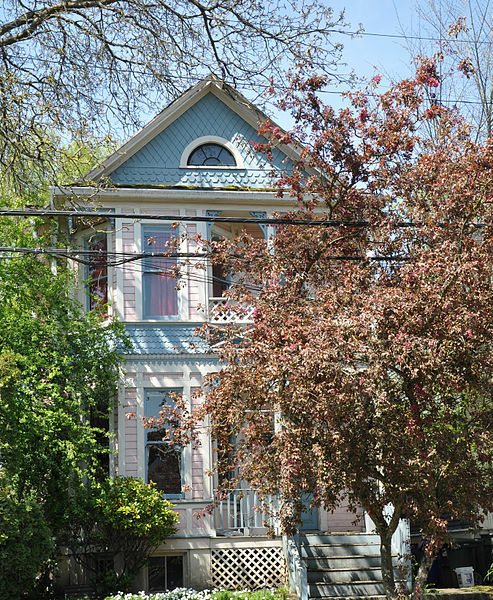 Classified a Queen Anne/Vernacular, this home was built in 1892. Designer unknown. This house occupies a lot in the middle of the block on the west side. Elevated approximately four feet above grade, the house fills most of the lot. A three foot high retaining wall of cast stone runs along the sidewalk. A mature deciduous tree stands in the southeast corner of the lot, and several small elms are located to the west of the house. This section of 12th Avenue is a transitional street between the residential neighborhood of Ladd's Addition to the east and mixed industrial and commercial uses to the west. Two-and-one-half stories in height, this house has an asymmetrical plan. The structure is covered by a cross gable roof with composition shingles. Two corbelled chimneys rise from the center of the mass. There are two distinct elements which make up the facade. They are a two-story polygonal bay and a double porch. Hie first floor porch has simple, square balusters. The secondstory porch has a balustrade composed of crossed 2 x 4s, which appear to be a later alteration. Porch posts are chamfered and have jigsawn brackets. Latticework has been added to the first floor porch in lieu of balusters between the first floor and the polygonal bay under. The entire attachment is covered by a shed roof. A simple rear entry porch with a shed roof is located across the rear of the house. The house rests on a brick foundation and has a full basement. The exterior surface of the house is clad with bevelled shiplap on the two lower levels. Diamond and hexagonal shingles are found in the gable ends. The predominant window type is narrow one-over-one double-hung sash. In three of the gable ends are one-over-one double-hung sash wir_dows. The window in the front gable is a multi-paned half-circle casement. All windows with the exception of those on the east side, have architrave moldings. Two original doors exist and they consist of three, molded wood panels with a single glass pane bounded by small squares of flashglass. The east elevation is the most ornamented of the elevations. Below the first floor windows in the bay are three molded spandrels, and the window openings have slight stick emphasis. Above the first floor, a decorative frieze consisting of a rounded sawtooth pattern accents the full length of the elevation and separates the first floor from the second. In the lower portion of the bay on the second level is a band of fishscale shingles. Three one-overone double-hung sash windows pierce the walls of the bay. Hood brackets and pendant decorate the southeastern corner below the second story fascia. This house is in good condition and is well maintained. It appears from the out of line siding above the main entry on the first floor that a transom light may have at one time surmounted the door. The interior of the house is divided into two flats. The floor plans of both units are essentially identical, and would appear to be as constructed. They are oriented off a stair hall that is located against the north wall. The finishwork consists of bevel-channelled shiplap baseboards, capped with crown molding. Door and window frames are combed molding with decorative pieces at the corner and base. Ceiling light flanges are of ornamental plaster and are located in the living and dining rooms of both units. The configuration of the first floor is intact, however changes have been made to some finishes and materials. Kitchen cupboards and countertops were replaced, as well as floor covering and baseboard molding. The configuration of the second floor is like the first floor. The access via the hallway to the second floor porch is the only deviation. The second floor kitchen was altered at the same time. The Gustave Bartman House, constructed in 1892, is locally significant under criterion C as a well-preserved example of the Queen Anne style of architecture as expressed in a modest vernacular building. Designed during the Victorian period, the building incorporates features of both the Queen Anne and Stick styles. The building is also significant as the earliest example of a multifamily dwelling, in the case a duplex, in the study area. The date of construction is based on city directories and confirmed by deed records. Gustave Bartman, a contractor by trade, may have built the house. It was constructed one year after the City of East Portland was incorporated by the City of Portland. Incorporation came on the heels of a population boom which created a huge demand for housing. Beginning in the late 80s numerous residences were constructed on the east bank of the river to meet this demand. Many of these dwellings were designed in the Queen Anne style which was popular at the time. distinguish the house as relating to the Queen Anne. The Bartman House has some decorative detail; however, it is limited to the facade and consists of porch brackets, imbricated shingles, flashglass, and an ornamental string course. The full-height window bay and double veranda further distinguish the house as a derivative of the Queen Anne style. The house is one of only a few remaining Victorian-era residences in the portion of the Hosford-Abemethy neighborhood which is under study. With the exception of the Firehouse Row houses, which are included as a part of this submission, the few that remain are in extremely poor condition or have been significantly altered.